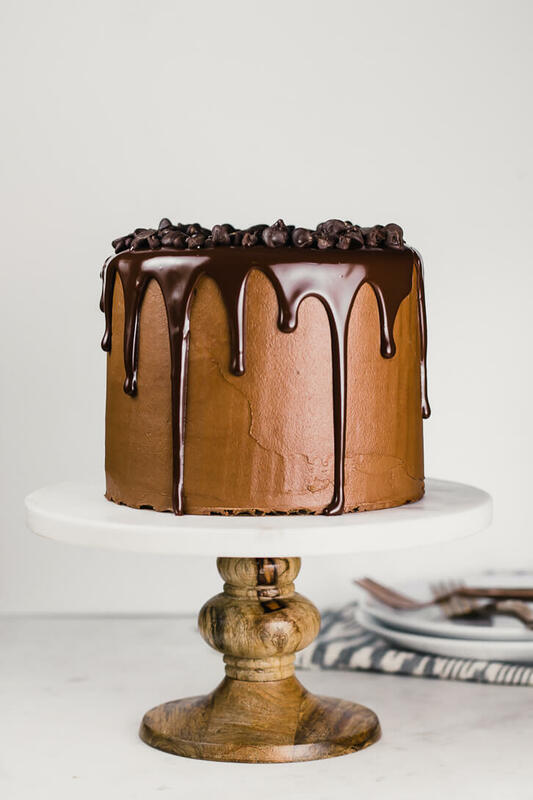 A three-layer, gluten-free chocolate cake recipe frosted with chocolate fudge frosting, topped with a dark chocolate ganache, and decorated with a ring of chocolate chips. I couldn’t have a gluten-free baking series without including a decadent, gluten-free layer cake recipe, now could I? In case you missed part one and two of the series, there are two pretty awesome gluten-free recipes waiting for you from earlier this month: these fudgy triple chocolate flourless brownies with salted caramel sauce and these no-bake chocolate chip cookie dough truffles made with oat flour. Having already gone the flourless route, as well as the diy oat flour route, I decided to try using an all-purpose gluten-free flour mix for this cake. I’m making sure to get all my bases covered when it comes to gluten-free baking! Make sure it includes xanthan gum, which helps the ingredients in your batter bind together. If you need an alternative to xanthan gum, guar gum should work as well. Of course, if you’re feeling really ambitious and have some more experience with gluten-free baking, you could always make your own gluten-free flour blend at home! Now, I mentioned above that these flour blends are advertised as a 1:1 replacement for normal all-purpose flour, but this doesn’t always work out successfully. While I do think these mixes make it fairly easy to convert a recipe to gluten-free, I’ve found it’s still very necessary to make (small) adjustments to the recipe. In particular, I found that my gluten-free chocolate cake ended up gritty and dense if I just did a 1:1 replacement with gluten-free flour. No fun! Start with sifting the gluten-free flour a couple times. I know, I know, I totally hate sifting too and I skip this step whenever I can. However, I found that this helps bring a lighter texture to the cake so I propose that it’s worth it! I increased the liquid in the recipe for added moisture. I also added a little extra baking powder to help give the cake more rise. Finally, make sure to let the batter rest for 30 minutes before baking. This is SUPER important as the starches in the gluten free flour need time to hydrate before going in the oven. This will help you avoid a gritty texture for your cake. And the verdict?? I served the final version of this gluten-free chocolate cake for a get-together with the girls and a friend who’s on a gluten-free diet was like, “this tastes just like normal cake! I wouldn’t even know it was gluten-free.” So, this is my new go-to gluten free cake that I hope will make all my gluten-free friends (and yours!) feel like they aren’t missing out on a thing! If you’re looking for more drool-worthy dessert inspiration (both gluten-full and gluten-free! 😉 ), you can follow along with me on Instagram, Pinterest, or Facebook. A three-layer gluten-free chocolate cake recipe frosted with chocolate fudge frosting, topped with a dark chocolate ganache, and decorated with chocolate chips. Preheat the oven to 350 degrees Fahrenheit and line the bottoms of 3 six-inch cake pans with parchment paper. Then, grease and flour the pans. Sift the flour a couple times, then add it to a medium-size bowl with the cocoa powder, espresso powder, baking powder, baking soda, and salt. Whisk to combine. Using an electric mixer, beat together the sugars and oil, then add eggs and vanilla. Beat until mixture is light and smooth. With the mixer on low, add half the flour mixture, mix until just incorporated, then add the buttermilk, followed by the remaining half of the flour mixture. Add in the hot water and fold into the batter using a spatula, then let the batter rest for 30 minutes. Divide batter evenly between the three cake pans and bake for 30-34 minutes. A toothpick inserted into the center of each cake should still be slightly dirty (not wet, but have several moist crumbs attached). Remove the cakes from the oven and let cool in pans for 5-10 minutes. Then, turn cakes out onto a wire rack to cool completely. Melt 4 tablespoons butter and 4 ounces chocolate together in a small saucepan over low heat, stirring frequently until completely melted. Set aside to let cool slightly. In the bowl of a stand mixer fitted with the paddle attachment, beat the remaining 1/2 cup of butter until light and fluffy. Pour in the melted chocolate mixture and mix to combine. With the mixer on low speed, gradually add the powdered sugar and cocoa powder, beating until incorporated. Add the vanilla extract and salt and mix to combine. Finally, add the heavy cream one tablespoon at a time, then beat on medium speed until smooth. Using a sharp serrated knife or a cake leveler, remove the rounded tops of each cake. Place the first layer on a cake board, using a small amount of ganache or frosting to attach. Using an offset spatula, spread an even layer of frosting on top of the first layer, then top with a second layer of cake and another layer of frosting. Finally, stack the top layer of the cake, cut side down. Frost the top and sides of the cake with a very thin layer of frosting (a crumb coat), then chill for 20 minutes. Then, frost with the remaining frosting and chill again. Meanwhile, make the ganache. Place dark chocolate chips in a small heatproof bowl. Add heavy cream to a small saucepan and heat over medium-low heat until cream is heated through and just starting to bubble at the edges (do not let it boil). Pour cream over the chocolate chips and let stand for 5 minutes. Then, whisk until smooth and let cool until ganache is just barely warm and drips slowly, but fluidly off the back of a spoon. Spoon ganache around the edges of the cake, pushing it slightly over the edge as desired so that it drips down the sides. Then, fill in the center and smooth with an offset spatula. Arrange chocolate chips as desired around the edge of the cake. **Can substitute scant 3/4 cup milk mixed with two teaspoons lemon juice or white vinegar. Let stand for 5 minutes before using. ***I used mini semi-sweet chocolate chips, standard size milk chocolate chips, and jumbo dark chocolate chips. Ghiradelli has great jumbo-size dark chocolate chips (see link above). This cake looks perfect and SO gorgeous! Thank you so much, Nicole! Hope you get a chance to try the recipe!! This cake looks so amazing! What kind/brand of cocoa powder do you use/pefer? Thanks Carolyn! I usually use Hershey’s – special dark if I want a deeper color!